Mark Wahlberg plays Marcus Luttrell, one of a group of Navy Seals sent on a dangerous mission in Afghanistan to remove a terrorist who routinely kills U.S. marines. Five of the Navy Seals are cut off in rough mountainous terrain and find themselves outmanned and outgunned by Afghan Taliban fighters. (When they encounter two young boys and an old man, apparently innocently herding goats, they are faced with the difficult dilemma of killing them because they are the enemy or letting them go, knowing they will alert the enemy of their presence.) 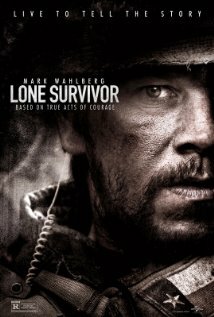 Lone Survivor is based on a book of the same name by Marcus Luttrell, the only Navy Seal to survive the ordeal. After the others have been killed one by one, Luttrell, himself wounded, is taken in by non-Taliban Afghans acting in accordance with an ancient code of honor. He would not have survived otherwise. Lone Survivor, like other realistic war movies before it, shows us how hellish war is and what a toll it takes on those who fight. It’s not just a bunch of pouty Calvin Klein models playing soldier-boy dress-up for the edification of the gals back home.